ie 19th and 20th century examples have six or seven lines of script) written in square Burmese script in black magyi zi lacquer made from tamarind seed, between intertextual hatched (yazamat) borders that are also filled with leaf sprays and occasionally, small bird motifs (characteristic of late 18th century motifs). 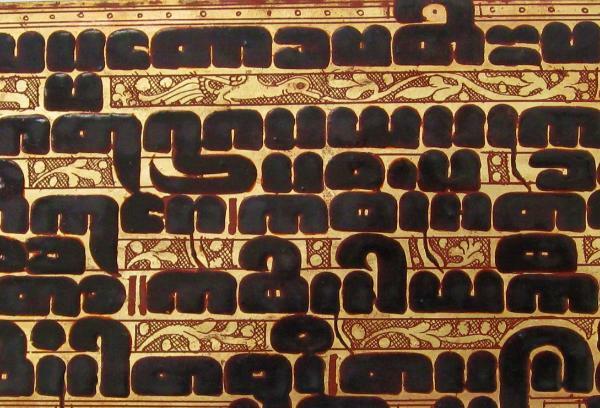 Each leaf is numbered in Burmese script in red lacquer on one side only.Kammavaca manuscripts were presented to novice monks and typically contained the rules and instructions of the monastery. Commissioning and presenting such manuscripts earned the laity merit and often were presented to mark important life cycle events such as an important birthday, marriage or birth. The manuscripts are read horizontally, from left to right. Each page is turned away from the reader once it has been read. The sets were handled with reverence and care. Singer, N., ‘Kammavaca texts: their covers and binding ribbons’, Arts of Asia, May-June 1993; Fraser-Lu, S., Burmese Lacquerware, White Orchid Books, 2000; Fraser-Lu, S., Burmese Crafts: Past and Present, Oxford University Press, 1994; and Isaacs, R., & T.R. Blurton, Burma and the Art of Lacquer, River Books, 2000. Detail showing the use of small bird motifs between the lines of text.